David Greenwood is the author of the book, Overcoming Distractions: Thriving with Adult ADD/ADHD, which looks at ADHD through the eyes of an entrepreneur. The book shares people’s stories and strategies. In this conversation, you will hear David share his story and experiences that lead to him developing self-awareness about his future and moving toward entrepreneurship. David explains how self-awareness and “owning yourself” can help lead to success. Allowing yourself to daydream leads ideas and innovation. [03:43] – David tells a story from his childhood. He believes this is his mother’s “aha!” moment. This led to his diagnosis. 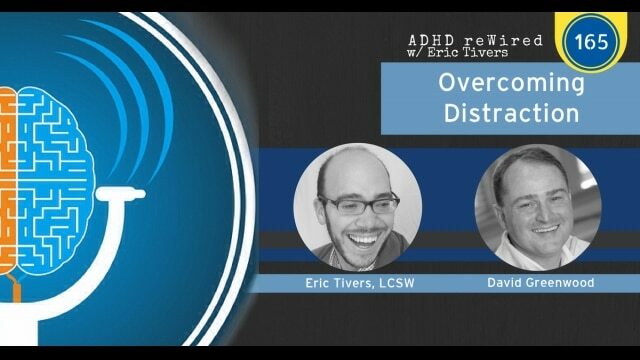 [05:48] – David shares his educational experience and getting off Ritalin. This leads to him talking about his early jobs and self-awareness about his future and eventually, entrepreneurship. [08:29] – David talks about owning a karate school. He talks about the early lessons he learned. [09:31] – David shares how he sets goals. He uses a legal pad to organize his goals, which are short-term. He also talks about accountability through his coach. [12:06] – Dave explains why exercise is important to maintain focus. [13:16] – Dave is a proponent of batching tasks and explains why that also helps with focus. [19:11] – Dave talks about meditation and how it helps him relax and develop ideas. [22:30] – David shares what prompted him to write his book. [33:38] – His next project is a career manual for people with ADHD. He talks about this project, which is yet to be named. [39:11] – David recently got an email requesting him to teach the “non-ADHD” version of his book. He explains how he is going through the journey of his new book with the reader. [44:25] – David talks about entrepreneurship and what aspiring entrepreneurs have in common. [47:25] – David shares a moment from his career that he deems to be a shameful moment.